Yoozon Premium crystal clear iPad 9.7 Inch (2017) / iPad Pro 9.7 Inch (2017)/iPad air/iPad air 2 Tempered-glass screen protector with 9H hardness. Made from superior 9H tempered glass that is scratch resistant and shatterproof protecting your screen from scratches to high impact drops. 99% HD clarity with high responsive touching performance makes your iPad 9.7 Inch / iPad Pro 9.7 Inch function work smoothly and faster. 0.33 mm thickness maintains original response sensitivity and touch feeling. 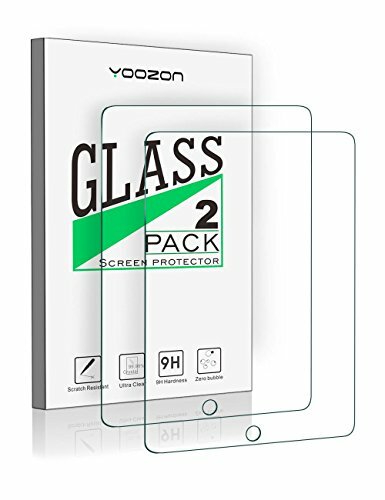 YOOZON offer the customers LIFETIME WARRANTY for thisiPad 9.7 Inch (2017) / iPad Pro 9.7 Inch (2017) screen protector. SCRATCH-RESISTANT: Made from superior 9H tempered glass that is scratch resistant and shatterproof protecting your screen from scratches to high impact drops. Oleophobic Anti-Fingerprint Coating- keeps your screen free of fingerprints and oily smudges and is easy to clean. HIGH TRANSPARENCY: 0.33mm thickness maintains original response sensitivity and touch feeling. 99% HD clarity with high responsive touching performance makes your iPad 9.7 Inch (2017) / iPad Pro 9.7 Inch (2017) function work smoothly and faster. Simple instructions allow for quick and hassle free installation. LIFETIME WARRANTY: Lifetime Warranty for refund or replacement. If the item you have received is defective in any way, please feel free to contact us for replacement or refund. PACKAGE INCLUDES: 2 x iPad 2017 / iPad Pro 2017/iPad air/iPad air 2 Tempered Glass Screen Protector,Micro-Fiber Cleaning Cloth, Alcohol package and Dust stickers,Installation manual.